There's something so wonderfully comforting about baking bread and the smell of bread browning in the oven. A slice of challah, smothered in butter is a simple taste of Jewish tradition. Drizzle with honey for extra sweetness. 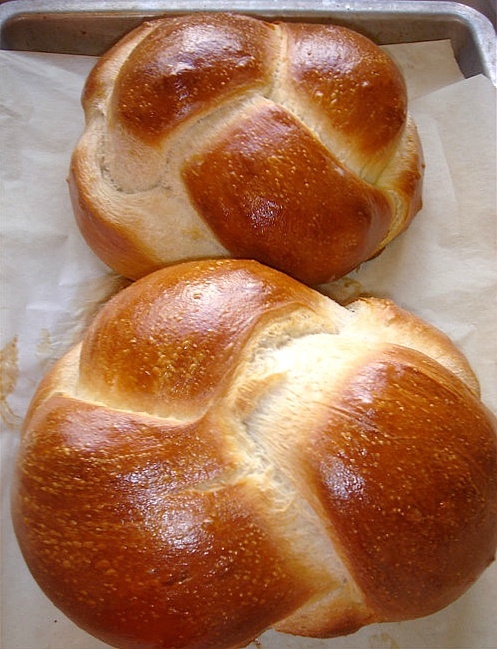 This braided egg bread is slightly sweet and customary for the Sabbath. Add golden raisins to the dough before shaping and top with poppy, or sesame seeds prior to cooking. 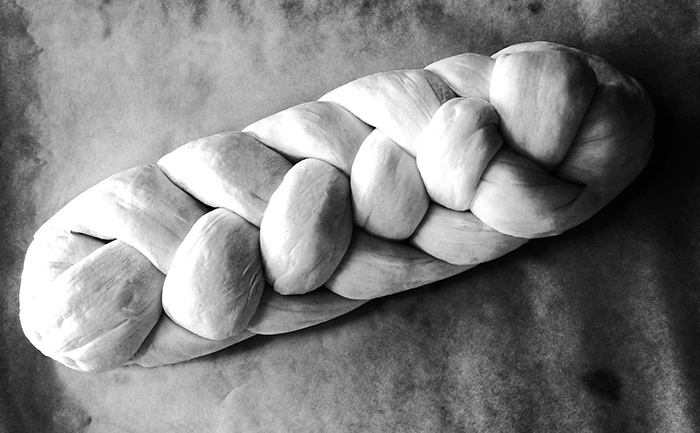 For Rosh Hashanah, the Jewish New Year, the loaves are often shaped into rounds to sybolize the cycle of life. In a large bowl, whisk 1 T. of honey and all of the yeast into water that has been warmed to 105°-110°F. Set aside the yeast until it bubbles, about 10 minutes. Whisk the oil into the yeast then and then whisk in the 4 eggs, one at a time. Whisk in the honey and salt. Gradually add the flour. Stir with a wooden spoon. When the mixture forms a ball take it out onto your work surface and knead it until smooth. This will take several minutes, but you do not want to overwork the dough. Divide the dough into two balls, place each in a clean bowl, and cover with plastic wrap. Let the dough rise until it has about doubled in size. This will take 1-2 hours depending on the temperature of your kitchen. Punch the dough down, cover, and let it rise for 30 or so minutes more. Divide each ball into 3 (or 6) strands to braid. Shape each loaf, place on a parchament lined baking sheet, lightly cover with plastic wrap and let it rise for another hour. Make an egg wash with the remaining egg and a T. of water or milk. Brush the loaves with the egg mixture. You can leave the loaves plain, or top with seasame of poppy seeds. Bake for 35 to 45 minutes until browned. Cool prior to serving.